Khalil Fuller dunks the basketball during a game against San Diego Christian on Nov. 13. 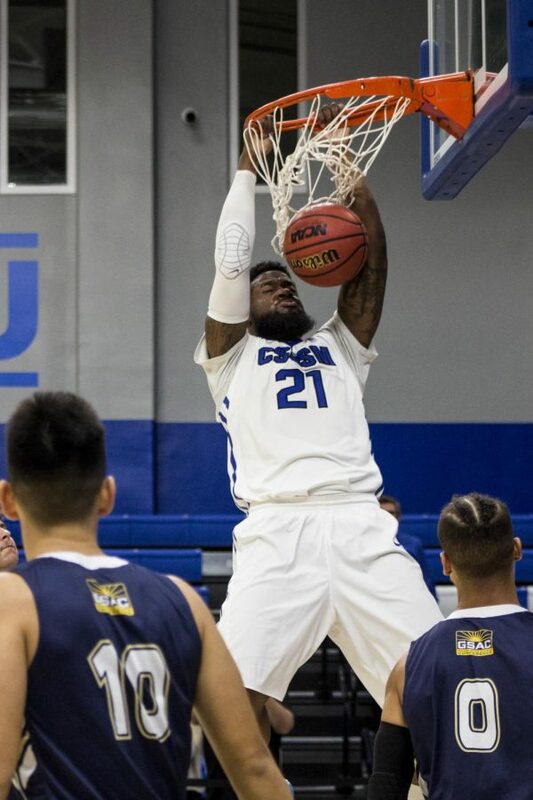 In the first home game of the season, the Cal State San Marcos men’s basketball team defeated the San Diego Christian Hawks, 84-76, on Tuesday, Nov. 13 at The Sports Center. The Cougars shot 50 percent from the perimeter in the second half and forced 19 total Hawks turnovers, including 13 steals, to help guide them to their first home win of the season. 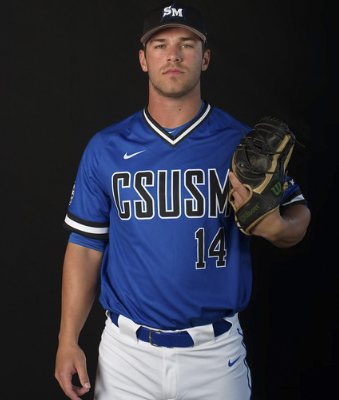 CSUSM improved to 2-1 on the year while the Hawks dropped to 1-2 overall. Following a made 3-pointer by junior, Asa Cantwell, CSUSM took its first lead of the game, 15-14, with 12:38 remaining in the first half. The Cougars did not trail for the remainder of the half and finished leading 44-37 at the break. Boosted by an 11-0 run to start the second half, SDC retook the lead, 48-44, at the 16:35 mark. Followed by a game-tying field goal by junior, Khalil Fuller, the Cougars took the lead back (55-52) when freshman, Bryce Sloan, sunk a shot from behind the arc. The back-and-forth contest continued when the Hawks managed to tie the score once again at 63 a piece. Despite their effort, CSUSM outscored the Hawks 21-13 over the final 8:43 of regulation. Led by Cantwell’s team high 17 points, two other Cougars also scored in double-digits. Junior Tyler Ginyard, finished with 10 points while Fuller recorded the team’s only double-double with 15 points and 16 rebounds. Senior, JR Williams, forced a game-high five steals. 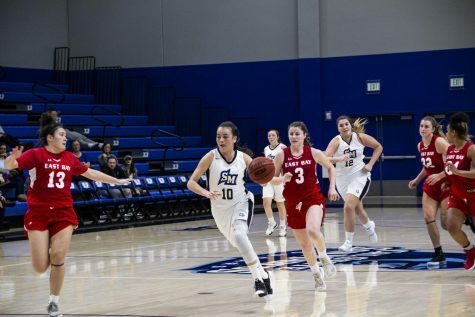 Through its first three games, CSUSM leads the California Collegiate Athletic Association (CCAA) in turnover margin (19.3) and rank third in assist/ turnover ratio (.97). Hawks senior forward, Nick Crankshaw, played all 40 minutes and tallied a double-double with 18 points and 10 rebounds. The Cougars will travel to Portland, Oregon to play in the Oxford Suites Classic. During their two-day northern trip, they will be playing Northwest Nazarene on Nov. 16 and Concordia (Ore.) on Nov. 17. Both games are set to tip-off at 5 p.m.